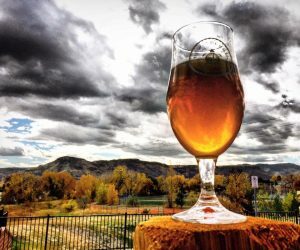 Did you know that Golden, Colorado, located 12 miles west of Denver, brews more beer than any other city on the planet? 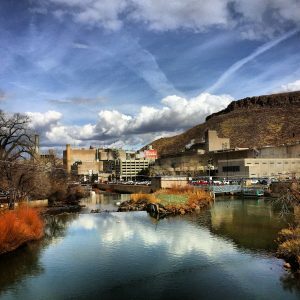 This is largely due to the fact that hometown favorite Coors Brewery is the world’s largest single-site brewery. But Golden also has an assortment of award-winning craft breweries producing wonderful ales, wheat beers, pilsners and stouts. On any windy day, the smell of hops will permeate the air in Golden, giving it a distinct, but mild and pleasant, smell that is sure to delight any beer lover. And beer lovers flock to Golden year round. They may come for the beer, but they stay for the town&apos;s charming atmosphere and natural beauty. Autumn is the best time to visit. After all, what&apos;s better than a delicious IPA after a crisp fall hike through gorgeous Golden? Golden is located in an area of spectacular natural beauty. To the east, are two mesas -- high flat-topped plateaus surrounded by cliffs - and to the west Golden is the spot where the Great Plains hit the Rocky Mountains. Most notable of the Front Range peaks which tower over Golden is Lookout Mountain that boasts a road filled with hairpin turns and climbs an unbelievable 1,200 feet in just four miles. Down below, Clear Creek cuts through rock to create a beautiful canyon before spilling out into and rushing through downtown Golden. Here are six classic Golden hiking or bike trails paired with a perfect pub stop for a beer afterwards. There you can soak in the autumn colors and savor the taste of fall. South Table Mountain and its twin North Table Mountain are landmark mesas rising above Golden. 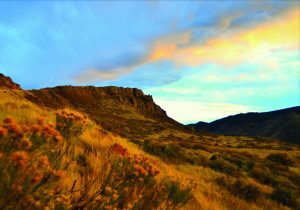 South Table Mountain is renowned for Castle Rock, Golden’s signature rock outcropping that offers commanding views of Golden and the Front Range. It was once home to a dance hall that was accessed via funicular, there are ruins visible today. You can access South Table Mountain several ways, but we suggest parking at the base of Golden Summit Trail and heading up the .6 mile trail. It’s very steep and you’ll g ain 1,500 feet in elevation before you reach the top. 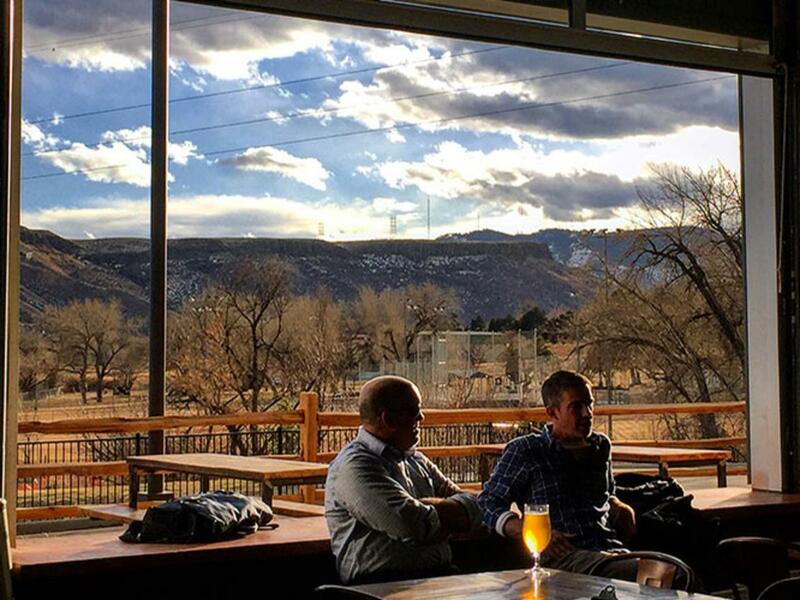 Enjoy the view and hurry back down for a craft beer at New Terrain. Beer Stop: New Terrain Brewing Co. is Golden’s newest craft brewery. It’s located on the eastern edge of North Table Mountain with a view down into Clear Creek Valley. Almost all the walls roll up, there&apos;s an outdoor beer garden with picnic tables, fireplace, food trucks, and eight beers on tap, with more coming. The beer is first rate, but it&apos;s the views and architecture that make it worth a journey. It&apos;s like a ski lodge dumped into the Front Range with buttes in every direction. Plan to spend the afternoon. Located just south of Golden on State Highway 93, this Jefferson County open space park has nine miles of trails. A particularly beautiful stretch is the 2.8 mile Red Rocks Trail, which climbs up some mild switchbacks, offering spectacular views of towering red rock formations as you approach Red Rocks Amphitheater. Another, more strenuous hike is the Dakota Ridge Trail, which climbs up and down along the twisting Dakota Hogback, an unusual geologic formation. The first dinosaur bones ever discovered were found along this hogback. Nearby on Dinosaur Ridge, you can see million-year-old dinosaur bones and dinosaur tracks, still visible in the rocks. Beer Stop: Located across the street from Coors, the Barrels & Bottles Brewery is one of the most unique Golden breweries. There are 27 craft beers on tap (a half dozen of their own and great guest beers from across the country) and 24 wine taps. If you’re not familiar with tap wines, it’s a growing trend and the freshest way to enjoy wine right from the barrel, including wines produced right here in Colorado. A local’s tip: Stop by and say hi to the owner’s two dogs, Pixie and Oba. 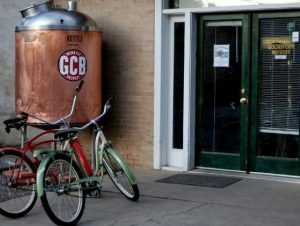 Beer Stop: The Golden City Brewery is just a block from the Clear Creek Trail and offers the one-of-a-kind experience of enjoying a beer in the brewer’s backyard. The brewery was founded in 1993 by two geologists, in an old machine shop behind their historic Golden home. The tasting room was originally located in the sun room of their house. Since that time, the operation has expanded and now the carriage house is the tasting room and their backyard is the beer garden. It’s a friendly place with everyone sharing tables and making new friends. In winter there’s an outdoor fire; in summer, there are often musicians playing. Order a beer through the Dutch door of the carriage house, find a table, and relax in the backyard. After a walk on the river, try the appropriately named Clear Creek Gold Pale Ale, an award-winning, traditional German Kolschbier hopped with Czech Saaz for a pleasant floral finish. Alternate Beer Stops: If you are Gluten-Free, Golden has a brewery for you! After your Golden adventure, head to Holidaily Brewing Co., the only dedicated, gluten-free brewing facility in the state of Colorado. Holidaily is dedicated to creating great-tasting gluten free craft beer.